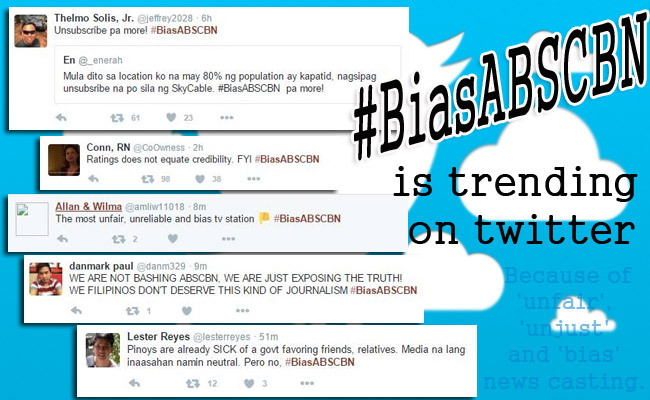 Early Monday morning, February 01, #BiasABSCBN started trending on Twitter. Based on tweets, it was the members of the Iglesia ni Cristo who urge the boycott against ABS-CBN because of their 'unfair', 'unjust' and 'bias' news casting. Netizens are outraged and infuriated because of how the giant local broadcasting network has been operating all these years. They say that ABS-CBN is manipulating the ‘news’ and is not being entirely fair. Though the majority of the displeased Netizens are members of the Iglesia ni Cristo, non-members are also joining the bandwagon. INC members warned the network that this online protest is just the beginning and soon, they will boycott its shows even its umbrella companies including SkyCable, Rappler and Inquirer. A few people have posted that they already had cancelled their subscriptions to the said companies. It all started when ABS-CBN reported the alleged corruption inside the Iglesia ni Cristo headed by Ka Eduardo V. Manalo which INC members found foul and one-sided for not taking Iglesia ni Cristo’s side. Ever since Lowell Menorca’s interview that exposed the allegations and accusations against the church and SCAN, members of INC are enraged and started crying foul. Some even said that ABS-CBN is doing ‘selective journalism’ and is only doing it for money and ratings. Though initially reported that the boycotts were by the order of INC, INC spokesperson Edwil Zabala already refuted that it is the Templong Centro who ordered the boycotts contrary to what a certain Israel Nono Ponce had posted on January 26. As of 8:27AM, the hashtag #BiasABSCBN gathered almost 35 thousand tweets and counting. 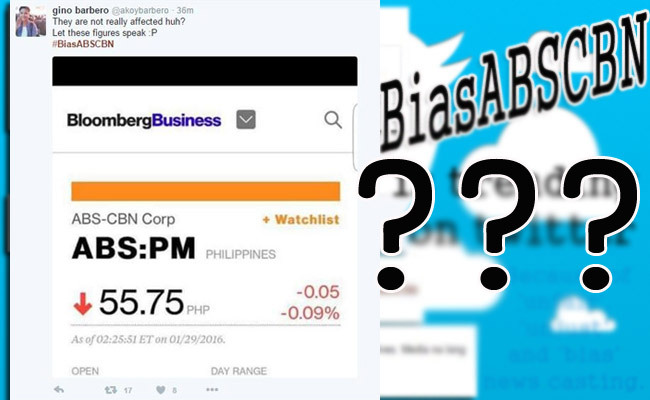 One netizen also posted a screen capture of ABS-CBN stocks which are hitting rock bottom, according to Bloomberg Business. Aside from the INC issue, a few netizens also posted that ABS-CBN seemed to favor Liberal Party Presidential Candidate Mar Roxas and started saying ‘NO TO YELLOW’, Yellow Media and more. ABS-CBN Corporation has not still released any statement regarding the ‘boycott’ and the allegations thrown at it.